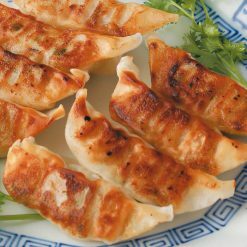 These garlicky gyoza are perfect as a side dish. Simply pan-fry and steam-bake to enjoy. Product totals 300g (15 pieces, 20g each). Sichuan, which is located in southwest China, is known for flavorful dishes using lots of pepper and garlic. 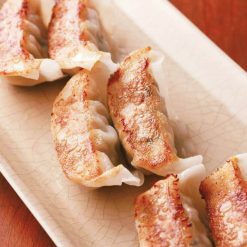 The filling for these gyoza includes lots of fresh vegetables and pork, and they are seasoned with garlic but are not too spicy; making them a great choice for growing children. 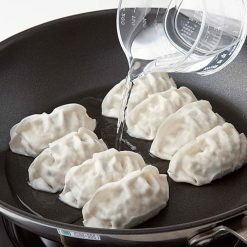 Distribute 1 tablespoon of oil in a heated frying pan, then add the gyoza (still frozen). Add enough water (80 to 100ml) to submerge the bottoms of the gyoza, cover with a lid and steam-bake on medium heat for about 5 minutes. Just before the water has all evaporated, lower the heat and add 1 teaspoon of oil. Fry for about 2 minutes. When the bottoms of the gyoza look pan-fried, they are done. This product contains vegetables (cabbage (domestic), onions, Welsh onions, garlic chives, garlic), pork (domestic), pig fat (domestic), granulated soy protein, table salt, sesame oil, soy sauce, fermented seasoning, potato starch, sugar, pork extract, katsuobushi extract, spices, wrappers (wheat flour, soy flour).. This product is not suitable for anyone with allergies to wheat, soy, pork or sesame. Origin of ingredients: cabbage/onions/pork (domestic). Prepared and packaged in Japan.